My wife and I love to listen to Jimmy Webb in concert. He is an engaging story-teller and songwriter. 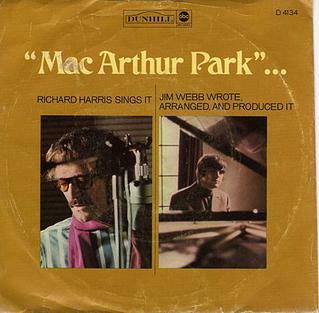 Jimmy Webb wrote, arranged, and produced “MacArthur Park” made famous by actor Richard Harris. Jimmy Webb and Richard Harris became close friends after they recorded the album, A Tramp Shining which featured the single. “MacArthur Park”. “MacArthur Park” turned 45 years old this year and Jimmy Webb finally got to do it in the real park in the Westlake neighborhood of Los Angeles, California on Saturday June 15, 2013. Webb says Beatles producer George Martin told him that “MacArthur Park” influenced the Beatles’ decision to let “Hey Jude” run beyond the 7-minute mark when they recorded it a couple of months after Harris’ record became a hit.